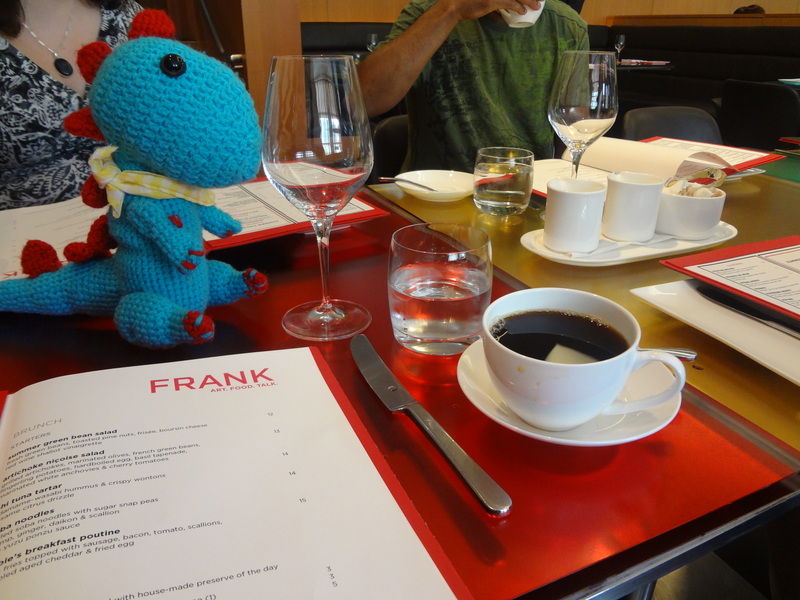 Frank restaurant’s mission statement is simple: Art, Food, Talk. We definitely had all three on a lovely Sunday morning. Named in honour of Toronto-born architect Frank Gehry whose redesign of the AGO has changed it from a tired building to a breath of fresh air. 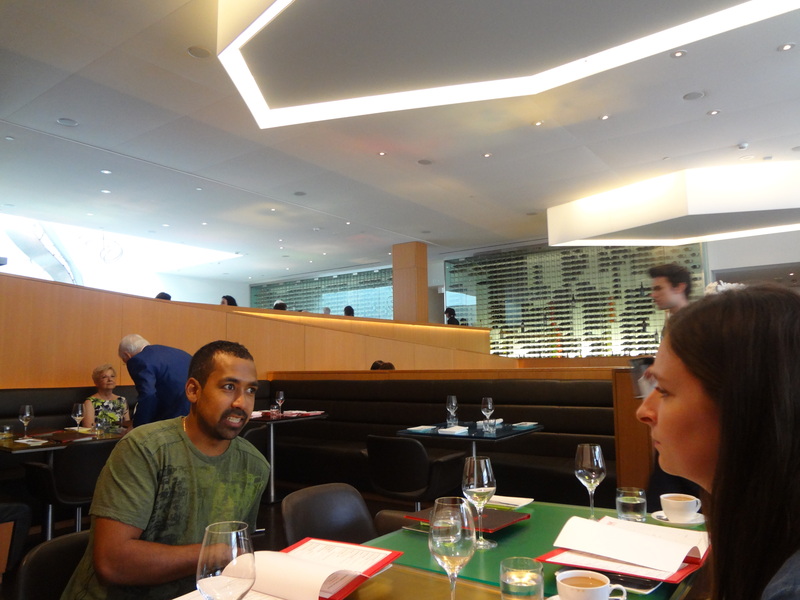 The interior of the restaurant has high ceilings and lots of welcome bold colours. Mostly, I was intrigued and envious by the floor-to-ceiling backlit wine rack! 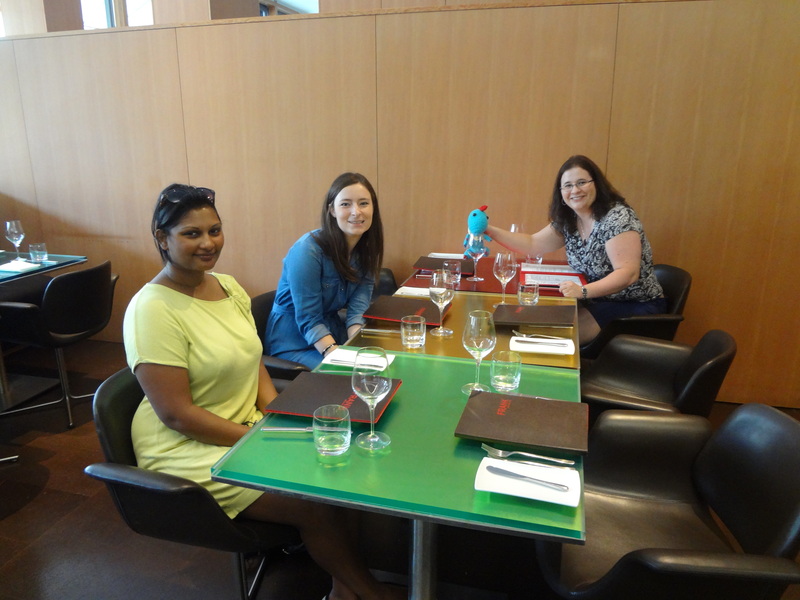 Perusing the menu along side me were Linds, Vanessa, Rachel, Squiggy and Sally. It was tough deciding on just one thing and it seemed like everyone was tempted by something different on the menu. Dubbed “robbie’s poutine” it’s kinda the best idea anyone’s ever had about brunch. Benny agrees! Now I don’t know who Robbie is but I can get behind this dish. Garlic Fries with sausage, tomato, bacon, scallions and aged cheddar (the 5 major food groups). Oh, and don’t forget the fried egg! 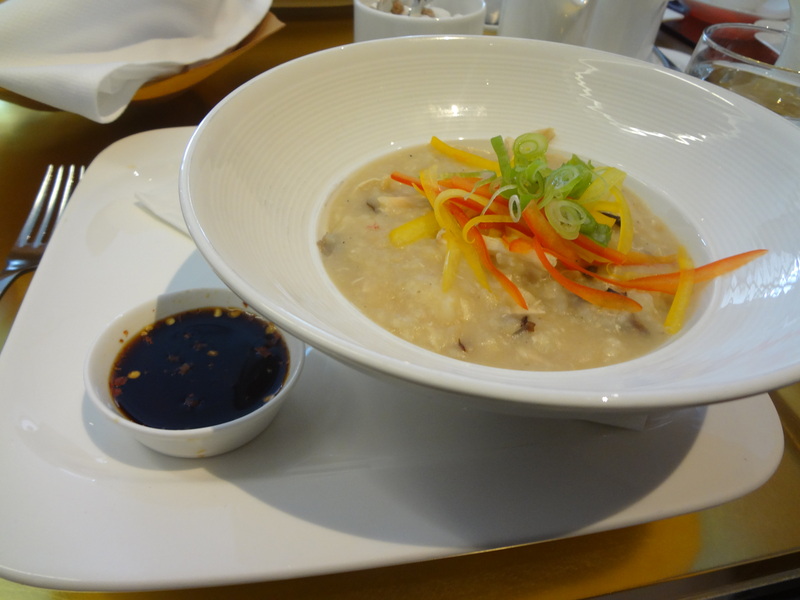 Squiggy’s choice chicken and ginger congee. A good and classy choice for those that are still hung over from weekend festivities. With shredded chicken and shiitake mushrooms, this seems more something I would choose if I were home with a fever but I wonder if it’s on the menu to help recover some of us that *ahem* over-indulged on the weekend. Now this wasn’t Squiggy’s problem on this morning in fact he decided to RUN to brunch. He’s kind of my hero. 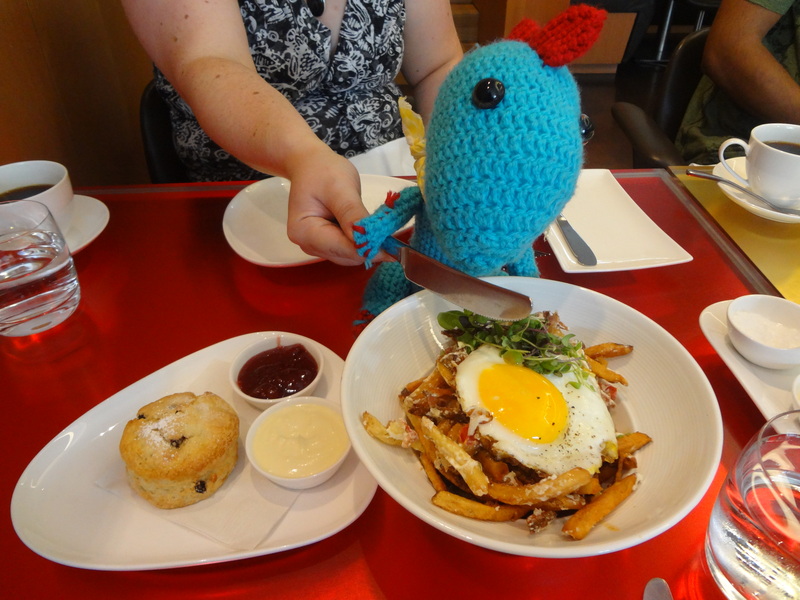 Squiggy said the flavours worked really well together but he was hoping for something with a little more kick. 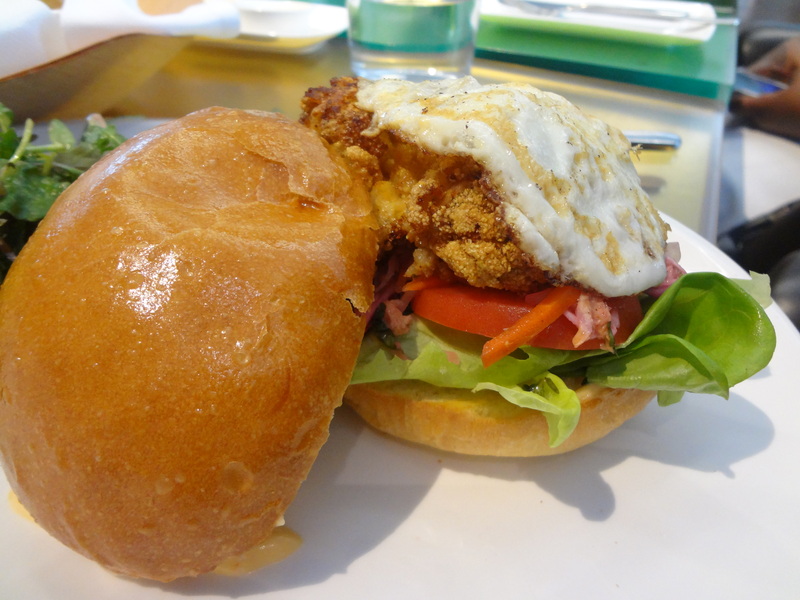 This monster had everything you ever wanted in a chicken sandwich, including the fried egg! No one cares who came first when you have this monster sitting in front of you. It’s your rich man’s McChicken sandwich with buttermilk fried chicken, slaw, garlic mayo and a fried egg lovingly embraced by giant brioche bun. It was messy to eat but no one was complaining! Sweet Potato Rösti. There are really no other words I need to describe this dish. You need to have it next time you go! Special mention has to go to the egg part of this dish. I’m not usually a fan of scrambles because more often than not it’s dried out or bland. Frank does an amazing job of keeping it moist and flavourful to go along with the herbed goat cheese, mushrooms and truffles. Remember: Sweet Potato Rösti. Probably the biggest disappoint in the meal were the Black Currant Scones. Maybe it’s because the week before I had a sconepiphany (that’s totally a word autocorrect!) but these ones seemed a little on the hard and dry side. 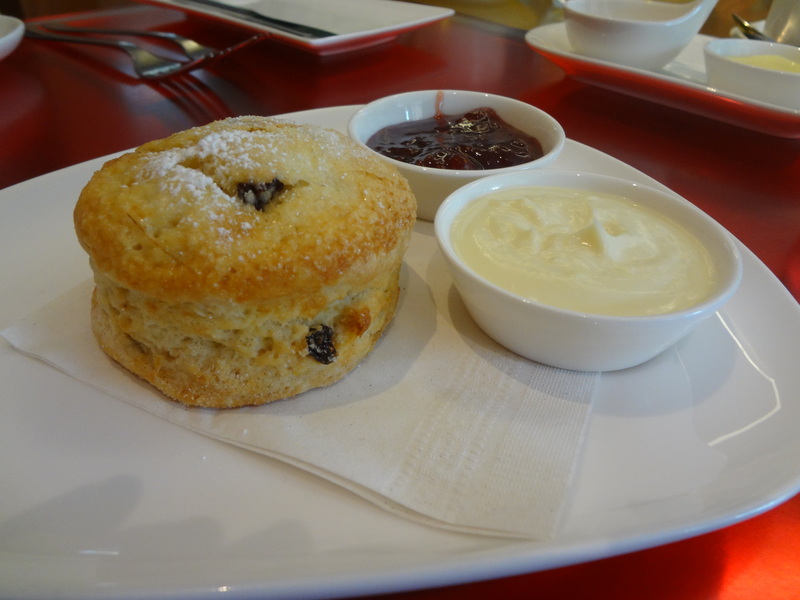 The scone shouldn’t need the extra fixings to make it good but I do have to mention the bacon jam and the creme fraiche fixings on the side were a nice touch. Overall an amazing meal with friends and not a bad way to spend a Sunday. 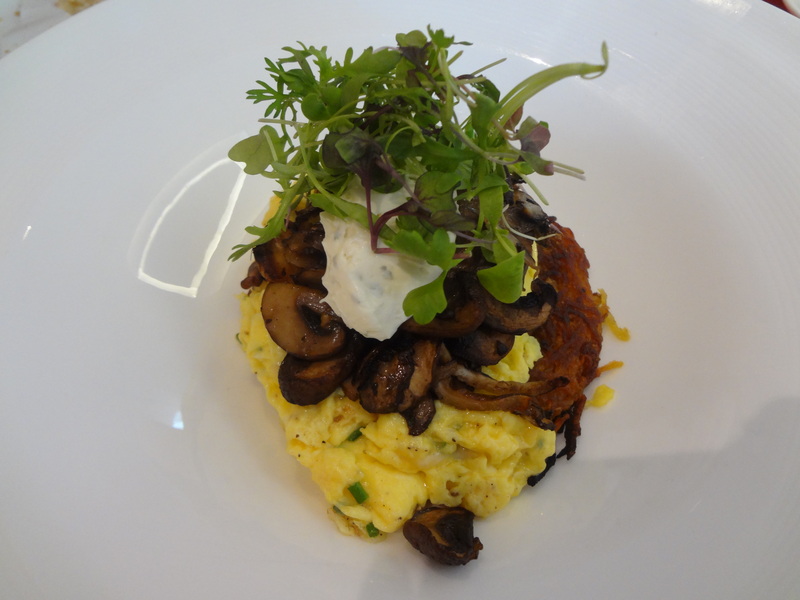 Maybe walk off some of that indulgence and take in some the AGO’s exhibits after brunch? Or maybe just enjoy the building. It’s one of the few places in Toronto where wood, glass and steel come together with perfect synergy. Suddenly the building feels alive, like it’s breathing. Just a few of our brunch buddies! Previous PostFancy Meeting You Here… Next PostHello Dolly!